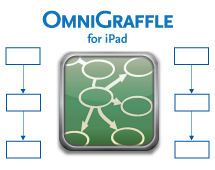 On of the Apps which I use on a regular basis on the iPad is Omnigraffle. Although it is by far the most expensive App I have bought so far, it is well worth the money. But there is one major feature missing at the moment: You can not (yet) import Visio drawings directly on the iPad. Until this feature is added, I have decided to create myself a little work-around using Omnigraffle on my Mac at home and Dropbox, combined with a bit of AppleScript magic. Here is how my workflow works at the moment: I have a Folder setup within my Dropbox which is monitored by an short little AppleScript. Once a new document appears in that folder, and it is a Visio file, the script is launching Omnigraffle, opens the Visio drawing and saves it as an Omnigraffle file back into the folder. This means that within a minute or so, I can access the converted file from Dropbox on the iPad and open it directly with Omnigraffle on the iPad. This works fine when I have the Visio drawing on a machine where I can save it to that Dropbox folder. Unfortunatly, this is something you can’t do on the iPad, meaning I still need a solution to access/convert Visio drawings when on the road, and only having the iPad with me. Well, once again, AppleScript comes to the rescue. I keep the Mail App running on my Mac at home, monitoring incoming Emails for attachments using a bit of Applescript. If the attachment contains a Visio document it saves the document into the above mentionned folder on my Dropbox, and from there it continues as above. Meaning it will get converted into an OmniGraffle document and saved back into teh folder. With this setup, I can basically open any Visio drawing within a couple of minutes from the iPad. If I received it by Email, it will get converted anyway. If I receive it from any other place, i.e download from a website, I can simply download the Visio drawing and Email it to my monitored Email account, and access the converted file within minutes through my Dropbox. If there is interest, I will publish the necessary AppleScript code here. This entry was posted in iPad and tagged AppleScript, iPad, Omnigraffle, Visio. Bookmark the permalink. I’m definitely interested, just got an iPad (I’m in Oz) and need to deal with visio diagrams. Already have omnigraffle on a macbook, missing the iPad integration. If you can post the scripts you’ve built I’d greatly appreciate it. I am trying to incorporate my iPad into my workflow for creating process flowcharts and the whatnot. A script like this sure would help me out at work I am forced to use a Windows PC. I have a proxy set up to sync my dropbox folder, so your first script sounds awesome. Thanks, some useful info was here. Thanks for the advice Mike. i would be grateful to see the applescript code. This is a great idea. I am loving Omnigraffle, but struggle with my office always wanting to run everything as Visio. It would be great to see the script you are using. I am new to Automator and while I can follow the structure, I have not been able to work out how you open new files arriving in dropbox folder and know how to then move file to the trash when the omnigraffle conversion has completed. However I have been able to work out how to script anything in Omnigraffle. I have tried the record function but on replay the context does not seem to ever move correctly to the Omnigraffle window. I can obviously do all of this by hand but automator has got the better of me. What am I doing wrong? once I have know I will then create a reverse dropbox function so I can email from the IPad and have an automator conversion back to Visio to share with colleagues. Can you please send me the applescripts you use to accomplish the automatic and mail conversion? Thanks in advance. Sorry for the extremely slow reply. Dropbox “open in” function recognises the file type of graffle so gives me the option to open in Omnigraffle. — 1. Change the properties at the beginning to match the behavior you would like as far as where to watch and what type to export as. — 2. Towards the bottom there is a “here is where you set the export settings” section where you can do the AppleScript equivalent of setting various controls on Graffle’s export panel. You may want to change the export settings here. See Graffle’s AppleScript dictionary for details on the setting names, and et cetera. — 3. Finally, you may also need to change the application name from “OmniGraffle Professional” to just “OmniGraffle” in process_item if you have the standard version instead of pro. — Then just run the script. It will keep running forever until you manually stop it. You could set it up as a startup item if desired. I would also like to know how to open a .graffle file from dropbox. Did they change this function in the DB app? anyway so will probably give it a shot. Dr. House - "How are we doing on cotton swabs today? If there's a critical shortage, I could run home." Dr. Cuddy - "No you couldn't."